The Sacramento City Unified School District has shared proposed changes to next year’s academic calendar. The proposed start date for next year is August 14, 2019. The proposed end date is May 28, 2020. These changes will benefit our students academically and also help increase their access to enrichment opportunities. The District has put together a list of some of the benefits of the proposed changes. Clean semester breaks that allow students to take their finals before Winter Break and come back for fresh lessons in January. Students will receive more instruction time prior to taking important exams at the end of the year including AP exams, SAT exams and other assessments. High school students will be out of school soon enough to be able to capitalize on opportunities to enroll in local community colleges, particularly in career pathway programs. Students will now be able to participate in various summer enrichment programs that start before our school year gets out. Many competitive sports teams start before our classes end. Students who have been unable in the past to participate on these teams can now do so. Students seeking work experience or who need a summer job to help their families pay bills, will now be able to better compete for jobs that have early start dates. Being able to hire teachers sooner, allowing our District to be more competitive with surrounding school districts in recruiting high quality teachers and other staff. Being able to hire for “hard to fill” positions sooner, in areas like special education, math and science. 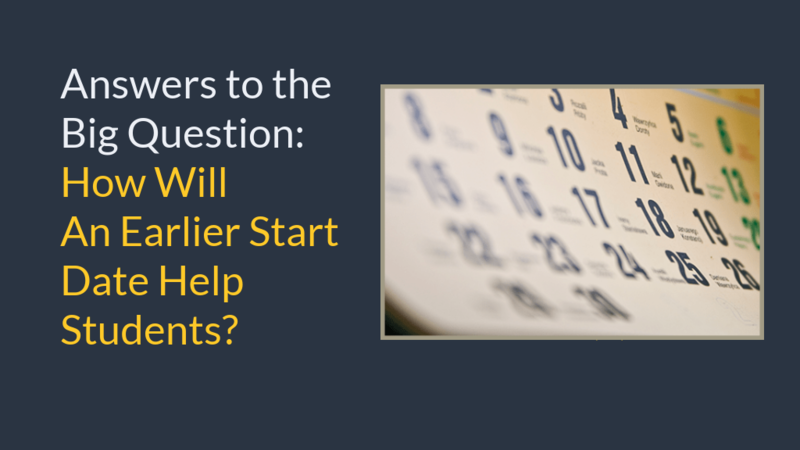 The District is compiling the most frequently asked questions received in recent days and will notify families of when answers to those questions are posted online. To read more about the history of proposed changes to next year’s calendar, please click here.